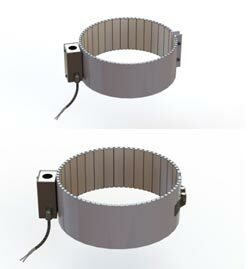 Ceramic Band heaters are specifically designed for higher operating temperature applications. The maximum operating temperature is 1400°F depending on the application. 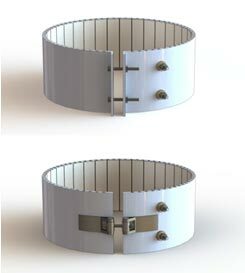 TriVolt Industries ceramic bands are manufactured with a galvanized steel shroud. Stainless steel is also available. Between the outside shroud and the ceramics we install a sheet of Mica and fiber insulation to prevent heat loss, making our heaters highly energy efficient and reducing your operating costs (available fiber thickness is 3/16”-1/4” and 1/2”). The interlocking ceramics make these heaters flexible, less prone to expansion problems and provide good thermal conductivity. Ceramic band heaters are easy to install and have a long functional life. A shroud of 26 gauge stainless steel is placed on the inside to prevent ceramics from moving and/or cracking. Maximum watts per square inch are determined by the diameter, width and type of application. TriVolt uses high quality nickel chromium on all our products ensuring the longest possible functional life. Ceramic band heaters can be manufactured with slots, holes, notches, European plugs and can satisfy all types of requirements. A number of terminals, wire lead options and terminal boxes offer great flexibility for field wiring. The terminations are TIG welded to ensure a solid connection. 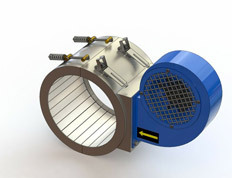 All our ceramic band heaters are installed on a round die during transport to avoid deformation and damages. Ceramic band with ¼ x 20 post terminal on each side of the gap. Option of tab or barrel nut mounted. All connections are welded on to post terminal. Heaters are coiled with Kanthal® wire Nichrome® 60. Outer sheet is made with 24 gauge 3042b stainless steel. A shroud of 26 gauge 3042b stainless steel is placed on the inside to prevent ceramics from moving and/or cracking. Silicone bonded Mica is installed between the outer sheet and ceramics to prevent lifting from the top of heater. Maximum operating temperature is 950°F. HT Ceramic heaters are coiled with Kanthal® A1 wire. Ceramic band with ¼ x 20 post terminal 180° from the gap. Ceramic band with ¼ x 20 post terminal on the same side of the gap. 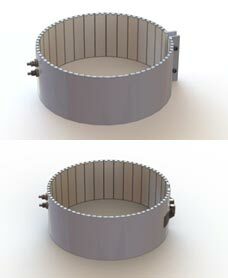 Ceramic band with ¼ x 20 post terminal 180° from the gap protected with 18 gauge satin coat terminal box. Ceramic band with ¼ x 20 post terminal 180° from the gap protected with an 18 gauge satin coat terminal box. Option of stainless steel braided (SS) lead wire connected to post terminal with high temperature terminal lugs. 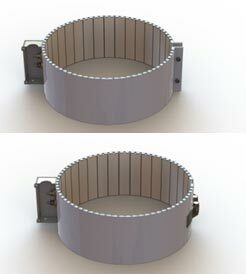 ADVANTAGE: if during operation wire is damaged, it can easily be replaced without removing the heater from the barrel. Option of stainless steel armour cable (AC) lead wire connected to post terminal with high temperature terminal lugs. Option of 3 phase, dual circuit or dual voltage. 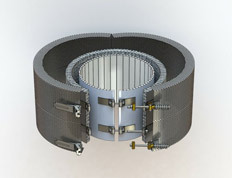 Squirrel cage motor as cooling system for ceramic bands. Option of shroud and grill available. For more technical information consult Trivolt. Shroud eliminates heat loss from the edges of heater. Cover the heater with a grill to protect against being burned during maintenance or operation. 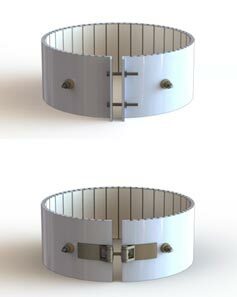 Can be attached to most ceramic band models. 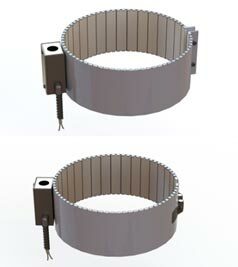 Barrel nut construction or latch. 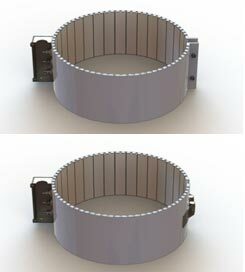 Option of holes and cut-outs for thermocouples available.